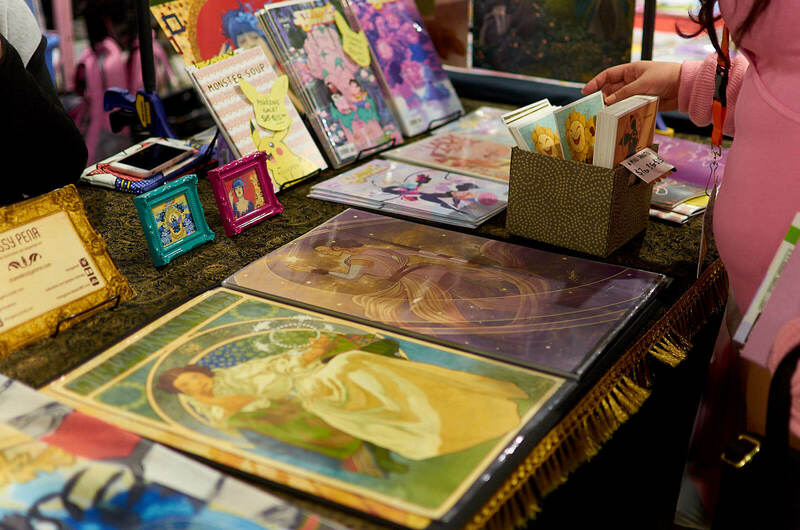 If you’ve ever been to an anime or gaming convention, you’ve probably strolled through Artists’ Alley, where artists exhibit both fan art and original work and con-goers dart from booth to booth, surveying the posters and keychains. I’ve always thought that Artists’ Alley is one of the best places to be: talented artists get to show off their best work, fans get to take home con mementos, and everyone wins. I visited Katsucon in National Harbor this year, and holy Nintendo, did I get lucky. Artists’ Alley was full of hardworking, creative women making everything from art history mashups to motivational posters to t-shirts. 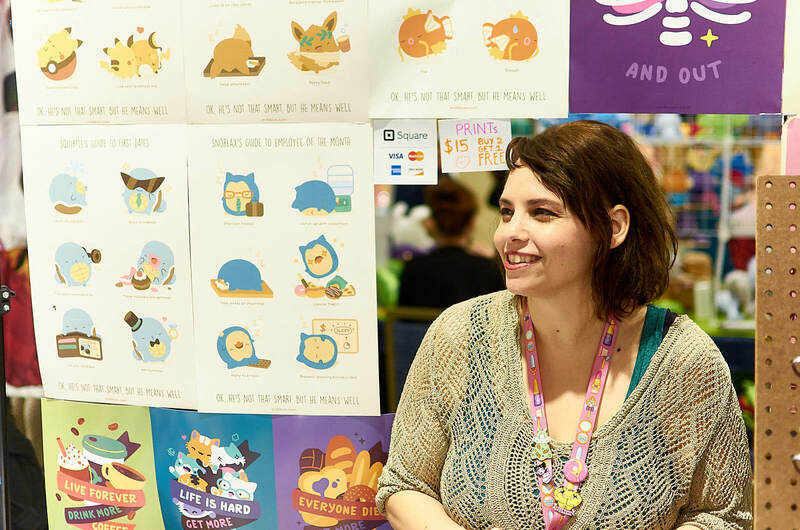 I decided to chat with a few artists whose work caught my eye to find out how they’d gotten into art, what selling at conventions is like, and what games and anime are inspiring them these days. 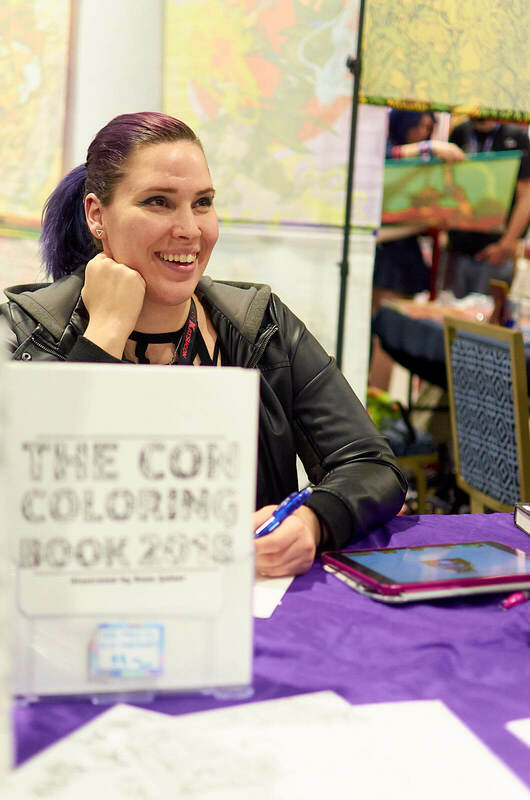 Daria Rhodes, who has over 20 years of artistic experience, exhibited at her first con 6 years ago. She only had original work then, but she immediately realized how much fun other artists had drawing fan art and decided to do the same thing. Rhodes studied graphic design, and she likes to work her design knowledge into minimalist, yet charming art that calls to mind infographics and posters. 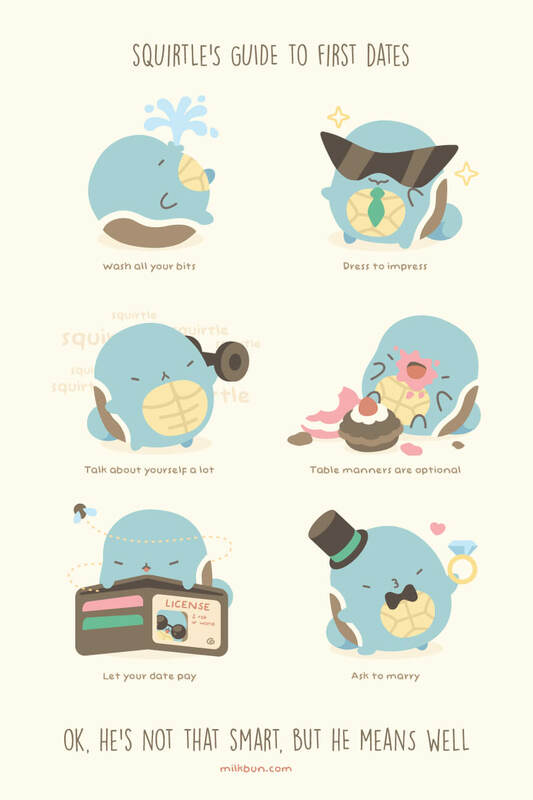 When I spoke to her at Katsucon, con-goers were flocking to her Pokébean “motivational posters,” which show Pokémon favorites like Pikachu, Squirtle, and Eevee trying (and failing) to succeed at work, college, and being an adult. “I love making art that people relate to. A lot of people see the art at my booth, get excited, and say, ‘Oh, that’s so me!’” Rhodes said. That, she told me, is why she enjoys exhibiting her work at cons. You can keep up with Rhodes’ shop, Milkbun, on Etsy, Twitter, and Behance. Missy Peña started doing Artists’ Alley as an eighteen-year-old at FanimeCon in San Jose. At first, her art was a hobby, but after she went to art school, it became a career. She worked for a while as an artist for Gaia Online, and in 2013, Peña decided to turn to conventions. Peña loves art history, and she realized that she’d stumbled onto something unique when she created a version of Le Chat Noire with Umbreon from Pokémon. 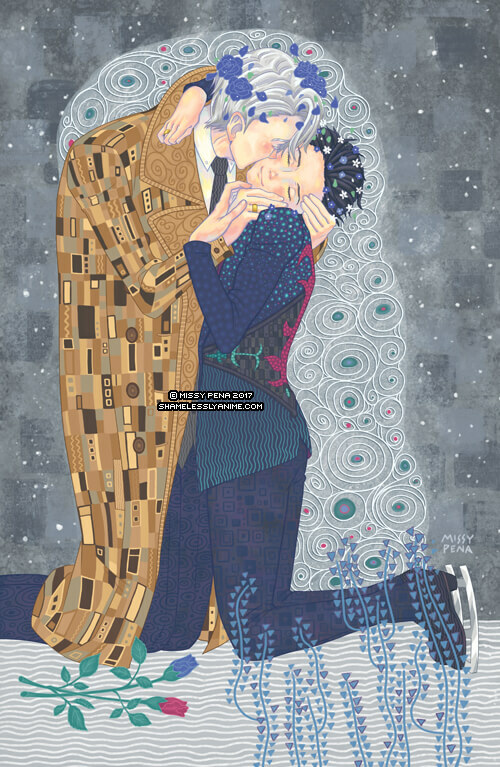 Since then, she’s combined Zelda and Leighton’s “The Accolade,” Black Butler and Fragonard’s “The Swing,” and Klimt’s “The Kiss” and Yuri on Ice, among others. Currently, Peña sells her work at conventions full-time, and she also does cover work for BOOM! Studios. Find Peña’s work on Redbubble, Patreon, DeviantART, and Twitter. Rana, who’s based out of Baltimore, MD, got her start as a con artist at KatsuCon. 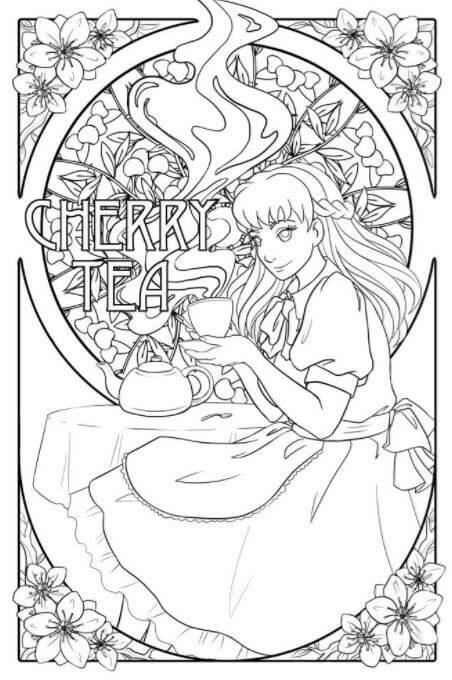 Her focus on original work and line art mean that she’s a go-to for commissions, as well as anything out of the box – like her official Katsucon coloring books. Gainer is a fan of coloring books, so when the opportunity arose to draw a coloring book for Katsucon’s younger guests, she jumped at the chance. 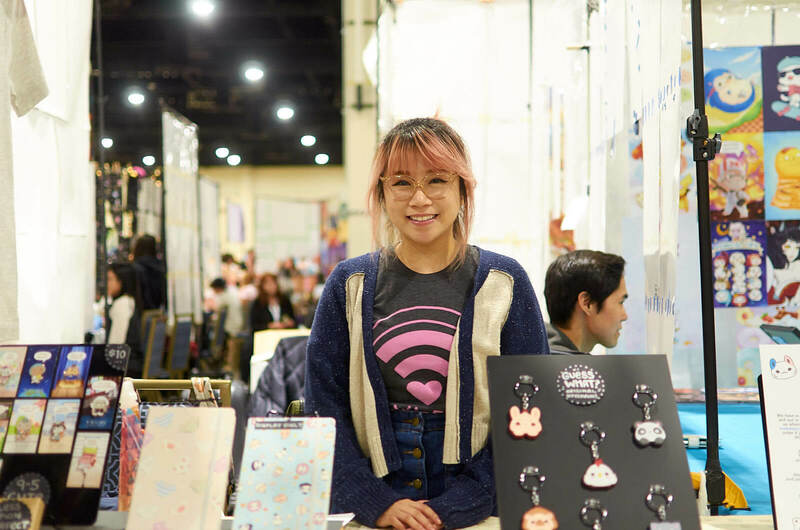 “I’m getting more into conventions and trying to grow that side of my artistic career,” she said, which is why she also designed Katsucon’s logo. Gainer enjoys creating original work, though she’s gotten some odd commission requests. “A guy asked me to draw him as Slipknot from Suicide Squad last year, swinging onto the scene with Tuxedo Mask as his best buddy,” she said, laughing. Ask Rana to draw something for you by visiting her website and Instagram. Riri got her first digital tablet as a clunky hand-me-down only four years ago. The digital art bug bit her hard, though, and she’s been creating cute graphic designs inspired by anime and comics ever since. Riri grew up watching cartoons on Saturday morning, so it was easy to turn to pop culture when she got serious as an artist. These days, she prints her designs on items people can wear and use, like t-shirts, notebooks, and lanyards. 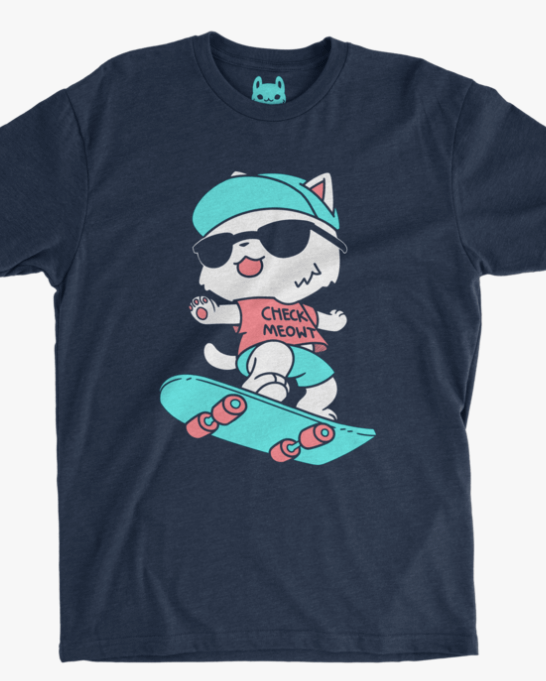 “It was inspired by Bart Simpson and skater culture,” she said, and grinned. Fans seemed to agree: they flocked to her table, pointing at Riri’s shirts. Find Riri’s t-shirts on her website, Instagram, and Twitter. Were you at Katsucon 2018 this year? What other artists were making art you just couldn’t leave the con without?